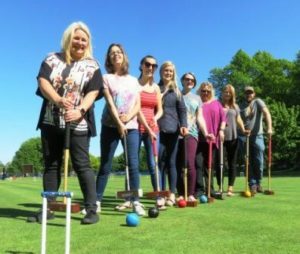 Have you considered croquet as the focus of a works event? The game lends itself to developing team building, or simply as an occasion for trying something new and enjoyable as a works social event. We can accommodate any number of people between four and twenty-four on the lawns at one time. Prices are typically £15 per person. We will be very happy to tailor arrangements to suit you: a typical one-and-a-half or two-hour programme might include welcome tea and biscuits; a short introduction to Golf Croquet and its tactics; basic guidance on holding the mallet, hitting the ball and hoop running; and plenty of time for sociable play. We are near the station, very close to major York hotels, and with everything from pub grub to fine dining close at hand. For an informal discussion please ring John Harris on 01904 620211 or Alison Larard on 01759 368123, or email yorkcroquet@gmail.com We will be happy to help.